Hearty Super Shreds! For a hearty salad with an added crunch, switch to the Super Shred Cone and shoot larger, thicker shreds of vegetables. Make elegant julienne cut potatoes and carrots for soups, salads and more! Mince onions in a jiffy - without the tears! Shoot super shreds of cabbage for crispy, crunchy coleslaw! Mozzarella or cheddar piled high on pizzas, tacos, or cheese breads will satisfy even the biggest cheese lover. Or, for a change of pace, use the super shreds in your wok for delightfully different stir-fry vegetables. These extra thick shreds cook super fast so they don't lose any flavor or texture. You can even give an old favorite a new twist - super shreds add a special zest to homemade vegetable soup, or give the ever popular chocolate chip cookie a super nutty flair! 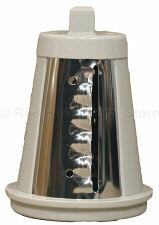 For use with Original and Mixer Too Salad Shooter electric slicer/shredder.